Cucumbers are 96% water. We need to keep ourselves hydrated in order to keep our body systems functioning properly. Dehydration can cause muscle cramps, dry mouth, and fatigue. These crisp vegetable is packed with Vitamin A, which is good for the eyes and is one of the antioxidants which our body needs to ward off cancer free radicals. 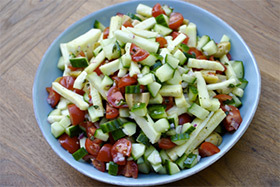 Cucumbers are also high in Vitamin K, which plays a key role in helping the blood clot and prevent excessive bleeding. The potassium in cucumbers help in the development of muscle tissue and helps maintain the electrical movement in our heart. The green skin of the cucumber has a cooling and anti-inflammatory effect on our skin and is used to help alleviate sunburn. Many skin products contain cucumber juice because it restores the health of skin cells and connective tissue. It can reduce redness and swelling around the eyes and can help reduce acne. When eaten regularly, cucumbers have been shown to reduce uric acid, thus precenting some types of kidney or bladder stones. Cucumbers also have a small, but reliable amount of phosphorous. Phosphorous helps maintain bones and teeth and helps your body store the energy you get from carbohydrates, protein, and fat. ​Fun Fact: Cucumbers age faster when stored with melons, tomatoes, and apples! ​This isn’t your mama’s pasta salad recipe! Welcome to a whole new pasta salad, one that has ditched the chewy pasta for crisp, fresh veggies, and contains all of the Italian flavors that you love. It’s a salad worth getting excited about! It’s hard to argue with fresh ingredients, and this salad is bursting with ‘em! Combine all of the salad ingredients in a large salad bowl. Toss with the vinaigrette and chill before serving. Keeps in the fridge for several days. Enjoy! Cauliflower is a member of the cruciferous vegetable (or Brassicaceae) family- along with broccoli, cabbage, kale, brussels sprouts. 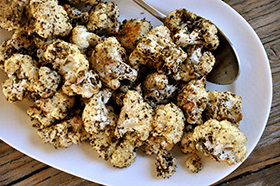 Due to its special combination of phytochemicals called carotenoids, tocopherols, and ascorbic acid, cauliflower highly correlated with preventing chronic diseases including cardiovascular diseases, diabetes, neurodegenerative disorders, and various forms of cancers because it helps to decrease the inflammation that causes these problems. A one cup serving is a mere 29 calories and has close to zero grams of fat, sugar, and sodium. However, it does offer 73% of the daily recommended amount of vitamin C, 19% of vitamin K, 11% fiber, and 9% protein. Cauliflower is gaining popularity as a rice substitute in many traditional recipes. Fun Fact ~ A world’s record was set in 2014 for the largest cauliflower. It weighed 60 pounds, 9.3 ounces, and was six feet wide measured across the leaves. 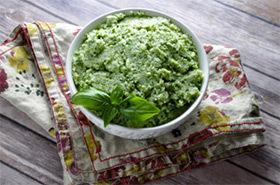 ​This recipe is a really lightened up replacement for mashed potatoes, with the enhanced flavors of garlic and kale. It’s incredibly quick and simple to throw this side dish together, and there are many ways in which the flavor could be tweaked and adjusted to your liking. Separate the cauliflower into florets and chop the stem. Stem the kale and chop the leaves. Add the cauliflower and garlic to the boiling water for 8 minutes. Stir in the kale and continue to boil for 5 minutes. Drain thoroughly. One serving equals: 76 calories, 5g fat, 8g carbohydrate, 3g sugar, 112mg sodium, 3g fiber, and 3g protein. Paprika is a ground spice made from red air-dried fruits of the larger and sweeter varieties of the bell pepper or sweet pepper plants, sometimes with the addition of more pungent varieties. Used for flavor and color, it is the fourth most consumed spice in the world and often appears in spice mixes, rubs, marinades, stews, chilis, and as a garnish. Most of the paprika sold in grocery stores is simply labeled “paprika.” Its origins may be Hungarian, Californian, or South American, and it is sometimes mixed with other chiles like cayenne. According to Nutrition Data sources, paprika is a good source of Thiamin, Magnesium, Phosphorus, Copper and Manganese, and a very good source of Dietary Fiber, Vitamin A, Vitamin C, Vitamin E (Alpha Tocopherol), Vitamin K, Riboflavin, Niacin, Vitamin B6, Iron and Potassium. Fun Fact – You can make Paprika at home! Dehydrate a variety of peppers, put into a spice grinder, sift through sieve to remove chunks, then store in a glass jar! ​Having healthfully prepared protein on hand for on-the-go meals is a MUST when it comes to packing healthy meals to eat throughout your day. 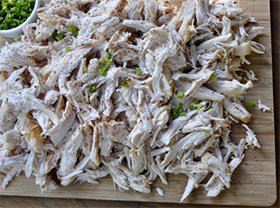 Put 4 to 6 ounces of protein (like this amazing pulled chicken! ), a handful of cooked veggies and a handful of fresh arugula in a little Tupperware and drizzle on a bit of homemade balsamic dressing for a simple, quick, get-lean meal. 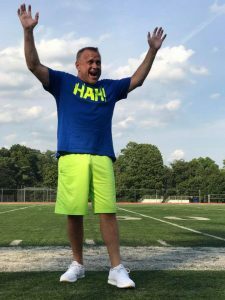 Eating small meals every few hours consisting of protein and veggies is the most reliable way that I know of to drop body fat and maintain a steady flow of energy throughout the day. It’s pretty darn tasty too, when you make the meals yourself! Rinse the chicken breast and pat dry. Season with the salt and pepper on all sides. In a slow cooker, whisk the chicken broth, tomato paste, paprika and garlic. Add the seasoned chicken breast and the bay leaves. Cover and cook on high for 3 hours, flipping the chicken after 1 hour. Transfer the chicken to a cutting board and let cool for 20 minutes. Strain the broth. Use two forks to gently shred the chicken, discarding skin, fat, cartilage and bones. Store the chicken and broth separately in the fridge to use for up to 4 days. Enjoy! One serving equals: 191 calories, 5g fat, 3g carbohydrate, 1g sugar, 960mg sodium, 0g fiber, and 34g protein. Folate, whish a B Vitamin richly found in asparagus, is essential to a healthy heart. Folate also helps prevent spina bifida and birth defects. The carbohydrate inulin found in asparagus helps increase the growth of beneficial bacteria in our gut while inhibiting the proliferation of harmful bacteria – which helps to prevent colon cancer. High in vitamin K, which keeps our bones strong and prevents calcium from building up to high in our tissues. Too much calcium can cause a stroke and/or heart attack. Many women have found that eating asparagus during their menstrual cycle helps to prevent cramps. Fun Fact: The fruit of the asparagus plant is a poisonous small red berry. Asparagus is a member of the lily family! ​This mixture of tender veggies is perfect for packed meals for the week. The savory and tangy flavor element from the vinegar adds the perfect amount of kick to liven up a serving of protein. 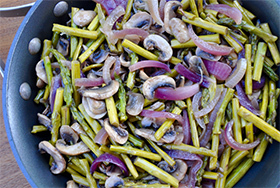 One of the reasons that I chose these three particular vegetables (red onions, mushrooms, and asparagus) was because it will last all week in the fridge without getting soft, soggy or otherwise undesirable. In fact, the flavors intensify over a few days and you can continue to enjoy the same batch all week! Place a large skillet over medium-high heat and add the olive oil. Once hot, add the onion and sauté for 4 minutes. Add the asparagus and sauté for another 4 minutes. Add the mushrooms and vinegar and continue to sauté for another 4 minutes. Season generously with salt and pepper and continue to sauté until the liquid is gone and the veggies are tender and flavorful. Enjoy! One serving equals: 43 calories, 2g fat, 5g carbohydrate, 2g sugar, 4mg sodium, 2g fiber, and 3g protein. The word “chocolate” is derived from the Aztec cacahuatl, meaning “bitter water,” and refers to the extremely bitter unsweetened drink the Aztecs made from ground cocoa beans and spices. Dark chocolate has large quantities of flavonoids called catechins, which may benefit heart health. Dark chocolate is an energy-rich food that provides about 170 calories per ounce; however, during processing varying amounts sugar which effects the caloric content. Eating dark chocolate provides you with a variety of minerals including iron, magnesium, copper and manganese. One ounce of dark chocolate contains 3 milligrams of iron. The theobromine in chocolate is a myocardial stimulant as well as a vasodilator, it increases heartbeat, and also dilates blood vessels, causing a reduced blood pressure. Fun Facts ~It takes 400 cocoa beans to make one pound of chocolate. The smell of chocolate increases theta brain waves, which triggers relaxation. ​Wait, an article about giving up sugar and then a recipe for cookies? Have I lost my mind? This recipe for Thumbprint Cookies is made exclusively using stevia, so you can avoid sugar and eat a cookie too! Stevia is a natural sweetener (derived from a leaf that you can grow in your own garden) that has zero calories and zero sugar content. The benefits are huge to using stevia as a sweetener of choice. If we can make cookies that have zero sugar content but still taste sweet and satisfying then shouldn’t we? It makes us healthier, leaner and more energetic. All without sacrificing the joy of having a delicious cookie. Sure, if you’ve never used stevia then there will be an adjustment period. A time to get your taste buds accustomed to the absence of sugars. But once you adjust then you’ll wonder how you ever handled all that sugar in the first place. Give these low sugar cookies a try! In a medium bowl combine the blanched almond flour, coconut flour, arrowroot starch, and sea salt. Whisk to remove any lumps. In an electric mixing bowl combine the coconut oil, cream and stevia until light and fluffy – about 5 minutes. Add the egg yolk, vanilla extract and almond extract on low speed until fully incorporated. Add the dry ingredients on low speed by spoonful until creamed into the coconut oil mixture. Shape cookies with a heaping teaspoon of dough, making an indention with your thumb. Place the cookies on the prepared baking sheet and bake in the preheated oven for 12-14 minutes, until lightly golden. Cool for 5 minutes on the pan before removing. While the cookies bake, melt the chocolate and coconut oil in a double boiler, mixing until smooth. 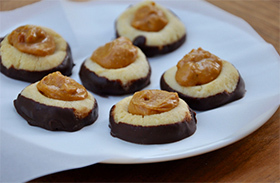 Dip the base of the cookies and pour a little chocolate into the indentions, topping with a teaspoon of peanut butter. Transfer to a parchment paper lined pan that fits in your freezer. Place the cookies in the freezer for 5 minutes until the chocolate has set. Enjoy! One serving equals: 90 calories, 7g fat, 4g carbohydrate, 10mg sodium, 1g sugar, 2g fiber, and 2g protein. ​Chicken breast is a great source for lean protein in the diet, when eaten without the skin. A 3.5oz serving contains 142 calories and 3.1g of fat. The chicken is a descendant of the Southeast Asian red jungle fowl first domesticated in India around 2000 B.C. Most of the birds raised for meat in America today are from the Cornish breed and the White Rock breed. Chicken breast meat is rich in niacin at 59% of RDA. It is also rich in B-6, phosphorus, selenium, pantothenic acid, riboflavin, and potassium! Fun Fact – There are 26 people listed on Whitepages.com with the last name of ‘Chicken’. ​There are many ways to prepare chicken breast. You could grill it, bake it, sauté it or fry it. You could eat it cold or hot, spicy or mild. You could season it generously or leave it plain. You could spend lots of time and effort, or barely any at all. 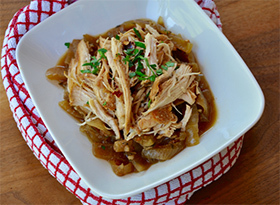 This Slow Cooker Balsamic Chicken tops my list of favorite ways to prepare chicken breast. It requires minimal time and effort and results in moist, tender, flavorful chicken that could compete with just about any fancy chicken dish. 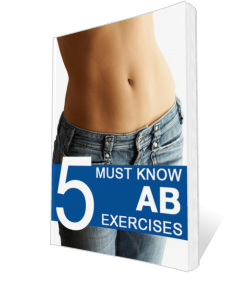 All while providing superb nutrition to keep you fit, lean and in control of your health. Place the onions in the bottom of the slow cooker and top with the chicken. Season generously with salt and pepper. In a small bowl, combine the balsamic vinegar, broth, stevia, both mustards, thyme, oregano, rosemary and red pepper flakes. Pour the mixture over the chicken and sprinkle with the garlic. Cover and cook on high, until the chicken is tender, for 4-5 hours. Garnish with fresh parsley. Enjoy! One serving equals: 130 calories, 2g fat, 4g carbohydrate, 1g sugar, 350mg sodium, 1g fiber, and 26g protein. ​Cauliflower is a member of the cruciferous vegetable (or Brassicaceae) family- along with broccoli, cabbage, kale, brussels sprouts. ​Fun Fact ~ A world’s record was set in 2014 for the largest cauliflower. It weighed 60 pounds, 9.3 ounces, and was six feet wide measured across the leaves. ​If you haven’t tried Za’atar, it’s worth picking up a bottle of the savory spice. It gives cauliflower a whole new flavor dimension. It’s also wonderful used to flavor meat for the BBQ. Preheat the oven to 375 degrees F. Lightly grease a rimmed baking sheet with olive oil. Wash and chop the cauliflower into florets. Combine the florets, olive oil, za’atar and sea salt in a large bowl. Spread the floret mixture over the prepared pan. Roast for 30 minutes until tender. Enjoy! One serving equals: 122 calories, 7g fat, 13g carbohydrate, 101mg sodium, 3g sugar, 7g fiber, and 5g protein.